Monarda (mo-nard-ah) Beebalm, Oswego Tea, Bergamot, Horsemint; Lamiaceae Family, Mint. Aromatic perennials of sturdy habit, growing in strong clumps. The showy, clustered flowers are white, lavender, pink, or red, blooming at the top of the leafy stem. Monarda’s very sweet nectar attracts scores of honeybees, butterflies and hummingbirds to the garden, particularly in mass plantings. They grow so vigorously and spread so rapidly they may need restraining in the garden. Some monarda species are often seen along roadsides. Monarda is useful in the herb garden, for a large border and the wild garden. An eastern North America native in bottomlands, thickets, moist woods and especially along stream banks, monarda is easy to grow and multiplies quickly. A clump-forming member of the mint family, monardas have tubular flowers borne in dense, spherical, mop-heads atop 2 to 4 foot tall stems. Monarda has a long summer bloom season. Removing spent blooms will prolong bloom cycle. The serrated, aromatic 3 to 6 inch long leaves smells like mint when crushed; and are often used to flavor teas and in salads. Monarda tolerates most soil conditions, but will grow best in organic, medium-to-wet, moisture-retentive soils in full sun to part shade. 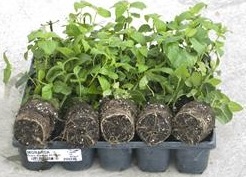 Soil should not be allowed to dry out, beebalm is not drought tolerant. Beebalm does well in full sun or partial shade. Plants multiple faster with shade, but will flower more in the sun. Most monardas multiply rapidly either by underground stems or self-sowing. To keep plants healthy and vigorous, they should be divided every three to four years in the spring. Monarda didyma (did-im-uh), Oswego Tea; is the usual species of commerce and cultivars. Monarda fistulosa (fiss-tew-loh-suh)--Wild Bergamot, to 5 foot tall, rose to purple flowers in late summer, leaves are more hairy and less toothed than didyma, stems grow out of the previous flower head, tolerance to dry conditions and mildew; herbal use in the treatment of headaches and fevers. Most cultivars are crosses between didyma and fistulosa, or among various cultivars. Propagation: Monarda can be started from seeds, but if you want to propagate the cultivars, start new plants by dividing the root clumps in early spring before new growth begins. Landscape habit, uses: borders, naturalized, bee, butterfly and hummingbird gardens, wild or native plant garden, meadow, herb garden, naturalized planting or along ponds or streams.